Illinois Gov. Bruce Rauner addresses April 10 NWZAW kickoff event in Chicago. Illinois DOT photo. 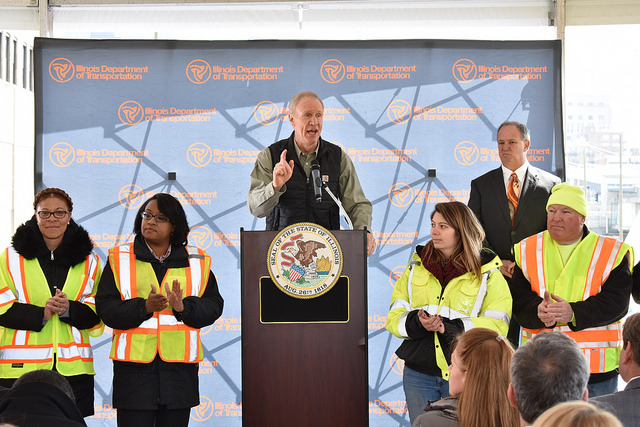 The 2018 National Work Zone Awareness Week (NWZAW), April 9-13, emphasized the theme that safety is “everybody’s responsibility.” Mark Barkowski, chairman of ARTBA state chapter affiliate, the Illinois Road & Transportation Builders Association, joined Illinois Gov. Bruce Rauner (R) and Illinois Department of Transportation Secretary Randy Blankenhorn, at the April 10 NWZAW kickoff event in Chicago. ARTBA produced a free brochure providing tips for safely navigating work zones, which is available through the ARTBA Foundation-managed National Work Zone Safety Information Clearinghouse. Over the past five years, over 3,300 people—including an estimated 650 workers—have been killed nationally in work zone crashes, with distracted driving blamed directly for at least 500 of the deaths, according to government data. More than 35,000 people annually are injured at these work sites.